Since Starbucks launched the Pumpkin Spice Latte nationally in 2004, drinking coffee mixed with autumnal spices such as cinnamon, nutmeg and cloves has been a seasonal custom for many Americans. 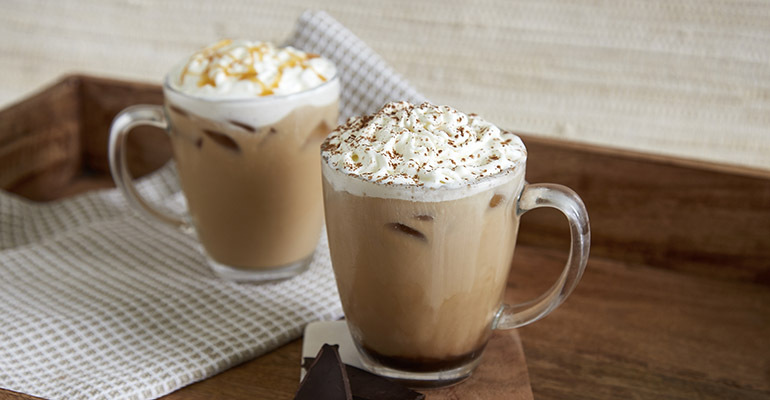 But now consumers are moving beyond the classic flavors — whether seasonal, like pumpkin spice, or year-round favorites like vanilla and hazelnut — to embrace a whole new range of java enhancements. Compelling new flavors also offer an avenue for coffee brands to boost traffic, particularly in the afternoon. Because while the morning cup, or cups, of joe that people use to fuel their days is often an unchanging ritual, the afternoon is a time to experiment. “For some customers, it’s the variety. They like the different flavors that are available,” said Sam Ferreira, president of Retail Food Group, parent company of It’s a Grind Coffee House and Gloria Jean’s Coffees. It’s a Grind, which has 23 locations, focuses primarily on premium unflavored coffees and espresso drinks, though not exclusively: It’s currently promoting a line of Cookie Gnar-Gnar iced blended espresso drinks flavored with chocolate, vanilla and Oreo cookies as well as optional peanut butter. 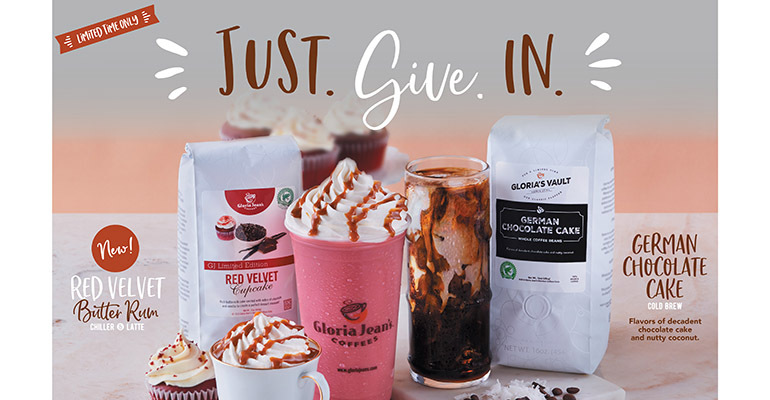 Meanwhile, sister brand Gloria Jean’s — which has 58 locations domestically and 1,200 shops worldwide — is all about the flavored coffee. a pound, or $55 for a 4-pound bag. Gloria Jean’s locations also include a variety of iced and hot espresso drinks featuring such flavors as coconut, cookie and chai. At eight-unit Alfred Coffee, based in Los Angeles, pumpkin spice has been off the menu for a while. 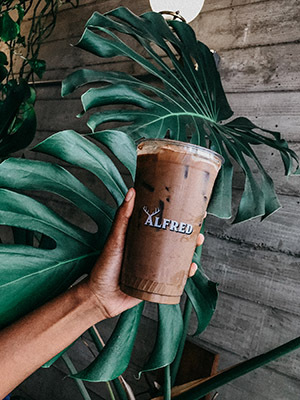 “We’ve avoided that for three years now,” said Jordan G. Hardin, food and beverage director for Alfred Inc., which also operates the four-unit Alfred Tea. But that doesn’t mean he’s not looking for ways to bring warm, comforting flavors into the mix. Last year he tried a sweet potato chai latte, but it was a flop. It was made with actual sweet potatoes, maple syrup, sea salt, fall spices and iced tea, all topped with cardamom. “I think it was the sweet potato part that weirded people out,” Hardin said. However, a vegan Holiday Nog made with almond milk and nutmeg “went off pretty well,” he said. “A pumpkin spice is a price of entry for operators,” said Gerard Bastiaanse, senior vice president for marketing at coffee supplier Farmer Brothers Coffee. But for some consumers, particularly Millennials, many of whom like to try new things on a matter of principle, variations on pumpkin spice can have added appeal. Bastiaanse said those can be as simple as pumpkin spice with caramel, pumpkin spice pie enriched with cream flavor, or pumpkin praline with pecans and caramel. Cardamom, a traditional flavor in Turkish coffee, has been appearing in more preparations. Emeryville, Calif.-based Peet’s Coffee, which has more than 400 locations nationwide, introduced a Vanilla Cardamom Latte, priced between $4.40 and $5.70, last August. 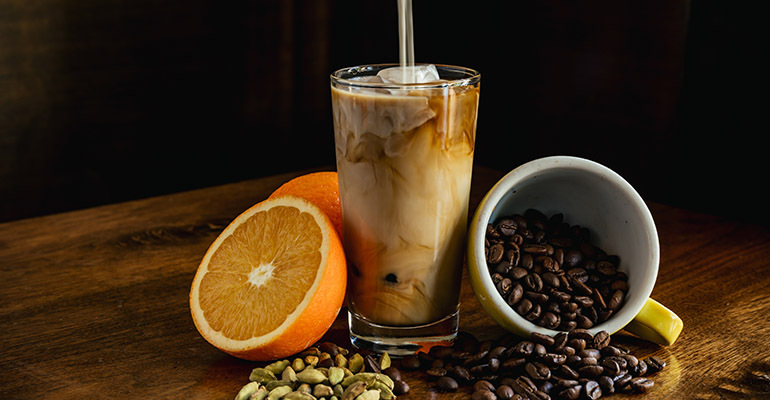 Mr. Espresso, a coffee roaster in Oakland, Calif., previously developed an Orange Cardamom Creamsicle coffee in collaboration with chefs Tony Ferrari and Jonathan Sutton of Hillside Supper Club in San Francisco. That drink was served at Coffee Bar, a three-unit chain in San Francisco and was made by adding a simple syrup infused with cardamom, orange zest and a little salt to cold brew coffee with milk. Starbucks is also branching out, despite the popularity of its Pumpkin Spice Latte, which the company said is its “top-selling seasonal beverage of all time,” with more than 350 million of the drinks sold over the past 15 years. The coffee chain recently has added The Juniper Latte, which was introduced in limited distribution in 2017 and more broadly for the most recent holiday season. That drink is made with espresso and steamed milk flavored with juniper syrup, and topped with milk foam and pine-citrus sugar. In the fall, it offered the Maple Pecan Latte, also available iced with Cold Foam, or aerated skim milk. Both lattes were $4.95 to $5.95 for a grande, depending on location. “Maple has become kind of a big buzzword,” said Emily Wood Bowron, assistant vice president of strategic marketing at coffee and tea supplier Red Diamond. Bowron added that she has also seen experimentation with different chiles, such as ancho, and earthy sugars such as Demerara and caramel. Bowron advised operators to base their coffee program on “a solid, great tasting, well-rounded coffee that you can serve on a daily basis,” and then playing with that coffee in the afternoon. But even as new flavors gain traction, it’s classic flavors that are trending, according to a 2018 study by menu research firm Datassential. Datassential asked 9,351 American adults representative of the general population to rate the appeal of flavors for specialty coffee, and blueberry topped the list — growing by 54 percent between 2014 and 2017. Eggnog and butterscotch grew by 46 percent and 45 percent, respectively. But seasonal flavors such as eggnog and gingerbread — which grew by 39 percent in popularity — tended not to perform as well during the first eight months of the year, when vanilla, caramel and chocolate still reign supreme, Datassential noted. Blueberry is a particularly good flavor for spring, Ferreira said, noting that Blueberry Sunrise is a popular Gloria Jean’s flavor. He said it mimics the fruity-floral notes of some fine Ethiopian coffees. “It’s almost like a muffin experience,” he added. As the weather warms up, Gloria Jean’s will also bring back apricot cream. Back in Los Angeles, Hardin of Alfred Coffee said spring may bring the introduction of lavender. He said he’s thinking of adding lavender honey and walnut bitters to coffee. “I’ve been playing with these non-alcoholic bitters to give a little nuance,” he said. He’s also toying with topping cold-brew coffee with cinnamon-infused coconut cream. Lavender’s likely a good bet, according to Bastiaanse of Farmer Brothers Coffee. “Floral seems to be trending in a broad sense,” he said. That includes not only “lots of lavender,” but hibiscus and peppermint, too. Incorporating flavors that are familiar and associated with fond memories is also an effective strategy said Erin Slater, senior market and insights analyst for S&D Coffee & Tea said. Indeed, The Coffee Bean & Tea Leaf evoked the cookie butter trend in November with the Speculoos Cookie Butter Latte — with flavorings of shortbread, ginger and other autumn spices. And in December, It’s a Grind offered White Chocolate Candy Cane coffee drinks. Slater said she expected functional ingredients, such as mushrooms and turmeric, to continue to gain in popularity. Peet’s has been experimenting with turmeric for more than a year, most recently with its Golden Caffe Latte, for which turmeric is blended with steamed milk and then poured over espresso flavored with ginger and honey. It is $4 to $5 for a medium. “I was inspired by the South Asian beverage haldi doodh, which combines turmeric with ginger, and sometimes warming spices, in a sweetened, creamy hot beverage,” Peet’s Coffee senior research and development manager Patrick Main said in an email. As for mushrooms, Hardin of Alfred Coffee said he was surprised by the success of his Chagaccino, made by adding a blend of chaga mushrooms, cacao, vanilla and cinnamon to espresso and milk. It is priced starting at $6.50. He said the mushrooms added a woody, earthy flavor, and to add to the drink’s health halo, already benefiting from the mushrooms, he sweetened it with monk fruit. “That one’s been pretty crazy popular,” he said. This story has been updated with Emily Wood Bowron's correct surname.